Aren’t these so fab!? 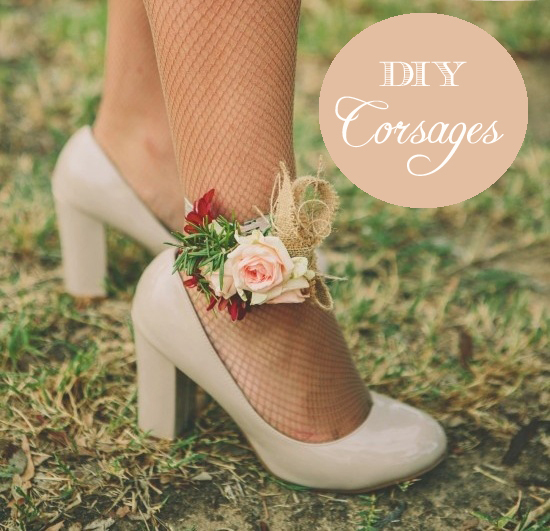 I especially love those made for the guests and that ankle corsage is so chic! Now here’s how to make your own, with a full tutorial from Lovely Vendor Blooms by the Box. Doing your own wedding arrangements is a budget-friendly option for brides. Many stay away from DIY flowers because they are afraid they are not creative or skillful enough to do their own arrangements. The truth is, if you stick with simple designs you can make your own bouquets, boutonnieres, corsages, and centerpieces. Not all brides who DIY are budget brides. 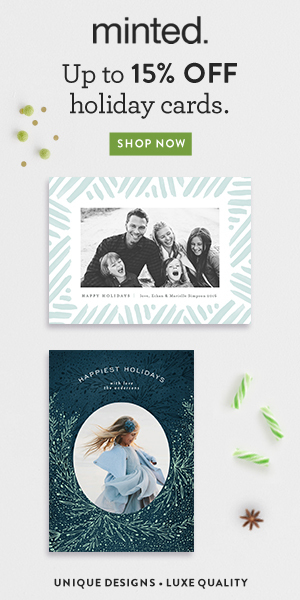 Some of them just want to spend their money on different wedding elements, or want to add a personal touch with a bit of DIY. But doing your own wedding florals and ordering bulk flowers online is a big budget saver. 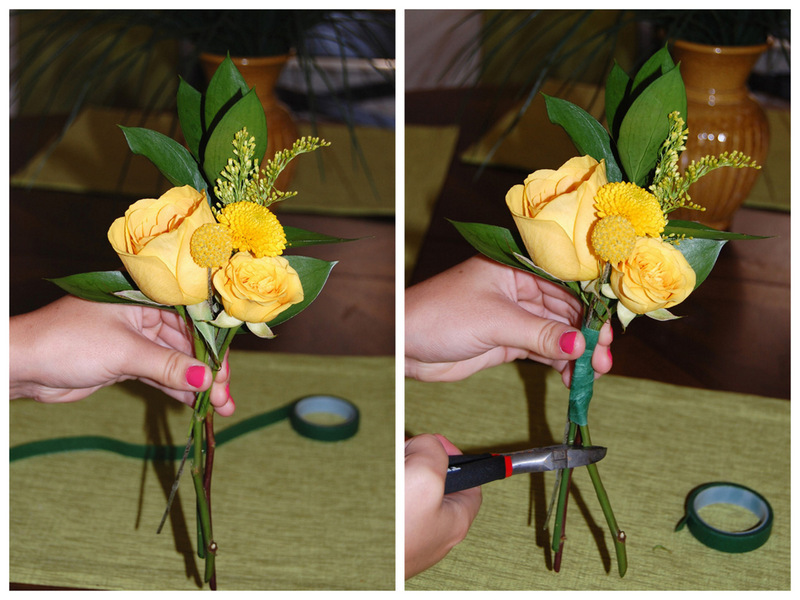 So here is a full tutorial to help you make your own corsages. Step One: Start out with the greenery and filler as the background. Add the rose to one side and the smaller spray rose to the other. 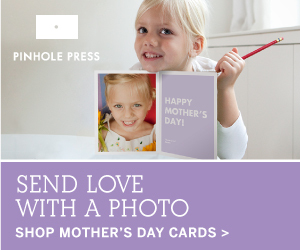 Then, fill in the space with your billy ball and pompon button. Hold everything as you would like it in place. Take your time and play around with the flowers until you find the perfect position. Once you are satisfied you now need to secure the flowers with floral tape. Step Two: Wrap the shoulder corsage together with floral tape. Floral tape sticks to itself when pulled taught. It is very easy to use and you will be a pro after one wrap around all the stems! Then you need to cut all the stems to the same length to make the finished and professional look. Remember, one of the major secrets in keeping flowers alive longer is to use floral clippers. 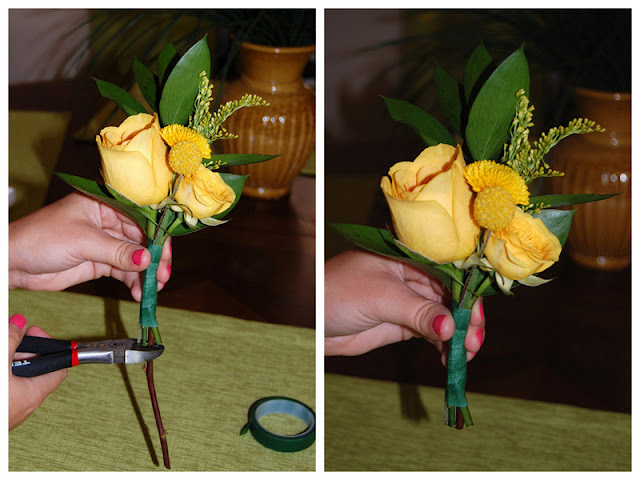 Using household scissors actually shortens the vase life of your flowers because scissors are not sharp enough; they crush the stems before cutting through them. Using floral sheers makes a big difference in how long the stems will continue to supply the flower with water. Step Three: It is always nice to add a little detail to the shoulder corsages. A great tip is to use wired ribbon; it is much easier to work with and holds its rounded shape! Tie a knot around the top of the stems. Then create the shape desired by folding ribbon over at different angles. Then use a corsage pin to hold down the ribbon or tie another bow on top. 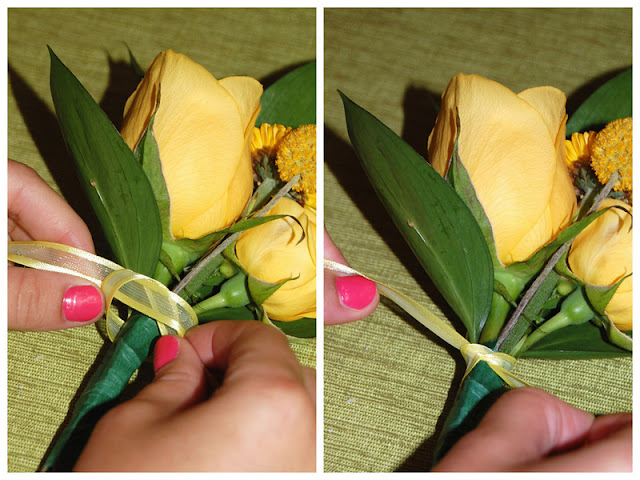 Making The Corsage Last: The number one thing you can do to make sure your flowers last is to prep them properly. 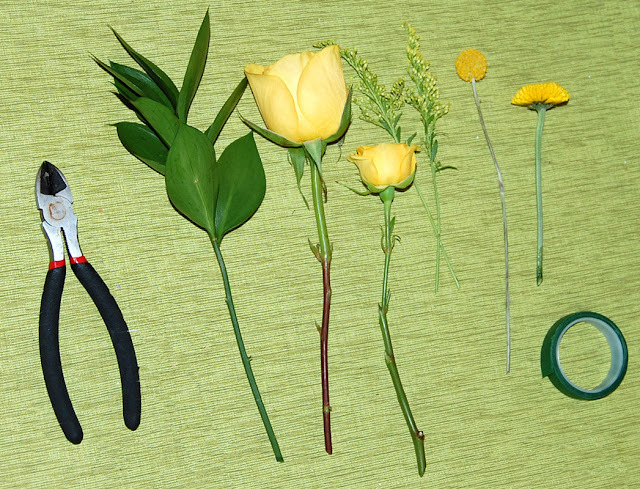 After you buy your bulk flowers, cut the stems (with floral clippers!) on a 45 degree angle under running water. Then store them in room temperature, clean water in a cool place out of the direct sunlight. Let them rehydrate for 5-10 hours before the arranging. A key tool for longer vase life is hydration solution. Once corsages are made, you cannot really put them in water. In order to keep them lasting for an entire event, dip the finished corsage or boutonniere in Crowning Glory Clear Solution. This seals moisture from the hydration process into the stems to maximize vase life. The reason why we specifically say to use Crowning Glory Clear Solution is because it is also a tool for spraying the arrangements once they are made; this increases the arrangements vase life as well as adding the finished professional look. So what do you think? Do you like the resurrection of the corsage? 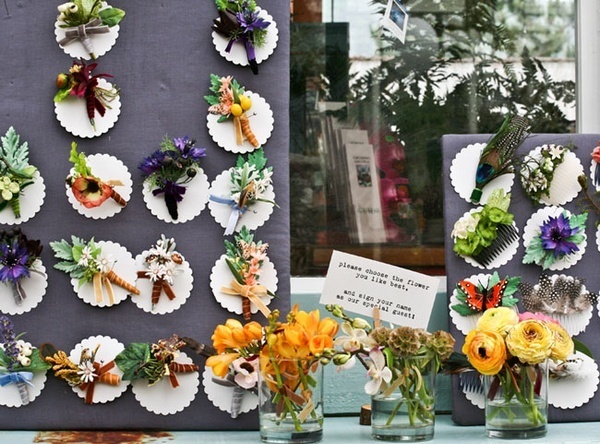 Are you going to try to DIY your wedding florals? If so, I hope this tutorial will help. Don’t forget to order your bulk flowers online from Blooms by the Box. And be sure to show me your finished product! member of our handpicked Lovely Vendor Guide, apply here. WOW REALLY NICE POST! I love those craspedia! Amazing tutorial and pretty pictures!! I love do it yourself things for weddings, my wife insisted to doing way more of this kind of thing than she ever should have. DIY corsages allow a deeper connection to your best day. 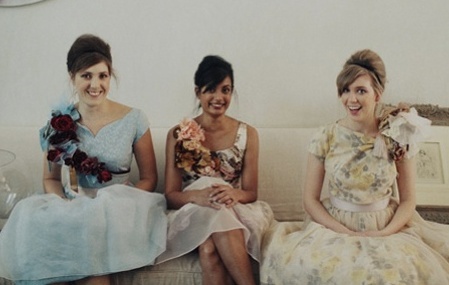 The bridal party appreciates things from the heart more, and you can individualize them which is always a plus. Simple and easy!! 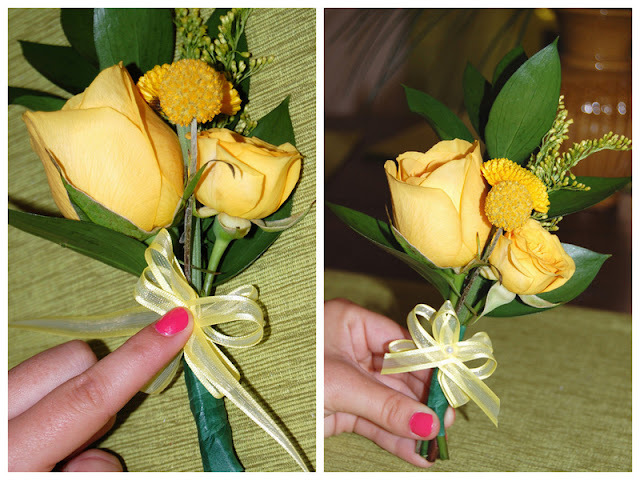 I love the idea of bridesmaid wrist corsages; it’s perfect for adding a pop of color!